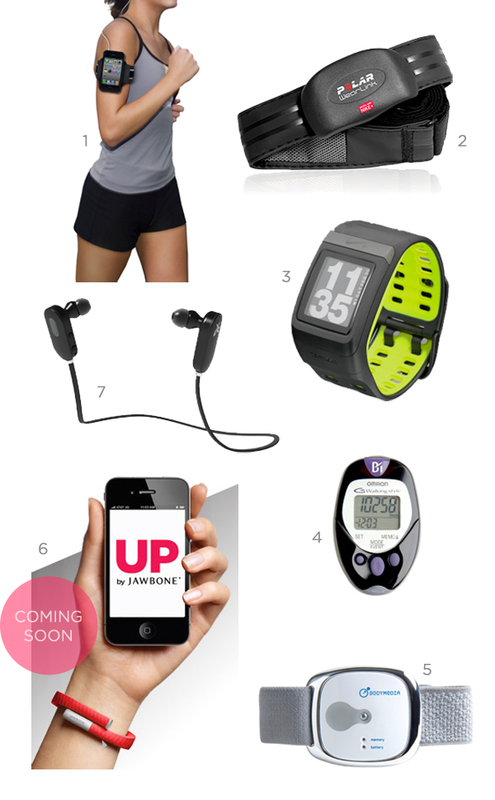 When it comes to workout gear there are tons of fantastic gadget options out there, it seems like the market is exploding with sweet stuff to enhance your exercise regime. Let's talk about the cool ones that have recently come out or are coming soon. Here are a few that stand out and are on my upgrade list. Add to the list in the comments if something works well for you too. 1: SportShell Convertible iPhone Case: I have been searching for a better clip system for my iPhone to workout with and this little multi-functional clip system looks like one of the best I've seen around. Clip it on to the strap and bam, off you go! 2: Polar WearLink Transmitter + Nike+: If you want to see what is going down with your heart and how hard you are working out, I've heard this one works really well (you can wash the band too - not plastic) and it also syncs with the Nike watch and iPod & iPhone gear. 3: Nike+ SportWatch GPS: My brother-in-law has this watch and I've played around with it a bit, it is cool looking and rocks. It tracks your runs with ease giving you lots of information about your distance, pace, elevation, calories, heart rate etc... I hope they come out with a little more feminine sized watch in the future because it is a tad bulky for my wrist, but still super cool. 4: Go Smart: These pedometers are great. You will often find my husband Mac and I wearing a pedometer striving to hit 10,000 steps a day - some days it is a fail, but it is motivating to see the number each evening. We've had many models over the years but have continually liked the Omron brand. I'm sure if you are in a big city getting 10,000 isn't a problem. 5: BodyMedia Armband BW: BodyMedia recently came out with a new armband that syncs directly to your phone and computer. It tracks your calories for the day, your sleep duration and efficiency and more. I have tried their previous model and it was enlightening to see the stats of my day. 6: Jawbone UP : I am curious and anxiously awaiting to learn more about UP which is due to come out later this year. It is a revolutionary new system that tracks your movement and looks pretty slick. 7: Jay Bird Wireless Earbuds : These wireless headphones are remarkable, I tried them on and was surprised at the sound quality and how I would never have to worry about twisted cords or having them fall out of my ears. I need those wireless earbuds. I can't count how many times my earbuds have gotten tangled on a machine and ripped out of my ears. Always scares me when it happens! I can't wait to see what Jawbone has up their sleeve with that one! hope it works better than the nike sensor..
Wireless earbuds?! I think I'm in love. I think the idea of the Polar HRM that synchs with other technology is great, but having owned the no-frills wear link I think the Garmin is better. The Garmin strap is also washable and I found the slimmer profile of the Garmin link and band more comfortable. Think about wearing the strap right under the heavy elastic of your sports bra - that is where mine hits. I appreciate the easy tech of the Garmin as well (compare the streamlined foot pod to the monstrous one Polar makes). Those earbuds look awesome! I think they may even make it onto my next wish list. I love the iphone app. it's so cool. I can do excercises wearing it.